Spinal injections for back pain relief – Is there a disconnection from rehabilitation? I recently gave a talk to a group of about 40 physiotherapists, osteopaths and chiropractors where I posed this question and asked for a show of hands. There was universal agreement that there was a significant disconnect. Looking at how to improve back pain treatment outcomes for both patients and over stretched healthcare budgets, there appears to be a significant opportunity to improve outcomes from spinal injections by making spinal rehabilitation an integral part of the post-injection treatment plan. There is a lot of debate about the merits of spinal injections. The Cochrane Review (1) concludes “There is insufficient evidence to support the use of injection therapy in subacute and chronic low-back pain”. As with many back pain treatments, it is difficult to get a black and white answer since there are so many variables in play. Self-pay patients typically bypass their GP and go straight to a physiotherapist, osteopath or chiropractor. Private patients who are referred to a consultant often receive a spinal injection without first having a course of rehabilitation. As a former member of the Society of Back Pain Research Committee said on stage at their annual meeting a few years ago, “I have a clinical intuition that they (spinal injections) are effective … and patients ask for them”. Working with so many different clinicians, the problem appears to be that once a patient sees a consultant and is given an injection, many are simply sent home with little more than a recommendation to remain active, to do exercises and to possibly see a physiotherapist. Given the costs of injections and clinical time, is this an efficient use of resources? Manual therapists often dismiss injections because they do nothing to address the underlying condition believing them to be a band aid at best”. Yet the purpose of the injection is not to cure the problem: it is to relieve pain to help the patient get on with their life. If a patient can then be more active then the body has a chance to heal itself. However, in the many cases where patients remain in pain it is perhaps in part because there is no proper rehabilitation. Then the issue we have is what kind of rehabilitation will they get? If it is in the NHS, then the sort of rehabilitation a patient might access is exactly the same physiotherapy treatment which failed to address the problem in the first place. Einstein’s definition of insanity is over quoted but to keep doing the same rehabilitation and expect a different outcome is surely insane … and an inefficient use of valuable resources. Many spinal injections are given in the private sector. One neurosurgeon I know sees approximately 1,500 patients a year. He operates on 3% and gives an injection to around 20%, i.e. around 300 patients. If a patient has an injection they leave hospital and then if they need follow up, they return to their consultant. In some circumstances patients will receive a further injection. 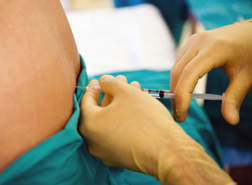 If the injection hasn’t worked then the patient is more likely to become a candidate for surgery. After all, conservative methods failed to resolve the problem. Yet, I can’t help but feel that many of the spinal rehab programmes for patients who reach a stage of requiring (wanting) injections are simply not intensive enough. Working with and talking to many clinicians, I often hear that if a patient is not better within four to six visits, then it’s time to look at other options. It has become accepted dogma. When IDD Therapy spinal decompression was originally developed, the clinicians who looked at back pain suggested in part that if they could work one on one with patients for eight hours a day, they would get much better results. When people seriously embark on a diet to lose weight or train for a sporting event, they approach their goal with a level of commitment and intensity that is quite different to an approach to back pain rehabilitation. Perhaps those involved in spinal rehabilitation should examine intensive programmes of spinal rehabilitation which are an agreed condition if a patient wishes to have an injection. IDD Therapy spinal decompression programme offers such a programme for patients with disc related issues. It is one method and undoubtedly not the only method. A case study recently received from one provider detailed a 33 year old male office worker with a six month history of neck pain and headaches. The patient received two injections during this time and felt no change. He then embarked on a twice weekly course of cervical IDD Therapy. After three weeks and six treatments, the headaches were gone and VAS pain was down to 1/10. A further two weeks saw VAS pain at zero and no headaches. That is a total of 10 treatments over a six week period. All clinicians will have an opinion on the efficacy of injections. The author believes that some people benefit from injections whilst for others there is no benefit, particularly without rehab. However as with all back pain treatments, the difficulty is being able to predetermine who will benefit and who won’t! There are significant costs to providing injections for back pain. However as the British Pain Society point out, the unintended consequence of discontinuing pain interventions may be that more patients then access more costly interventions such as spinal surgery. In the meantime, it would seem to make sense to reconnect spinal injections to a more intensive programme of spinal rehabilitation to help some patients return to a more active lifestyle. If you have a comment, do share for others. Staal JB, de Bie RA, de Vet HC, Hildebrandt J, Nelemans P. Injection therapy for subacute and chronic low back pain: an updated Cochrane review.Spine (Phila Pa 1976). 2009 Jan 1;34(1):49-59. Steadfast Clinics is the international distributor of IDD Therapy spinal decompression, SDS SPINA, Accu SPINA devices, Thermedic FAR infrared therapy systems and HydroMassage machines. Taking ‘Before Photos’ to improve rehab exercise compliance – Lessons from the fitness and weight-loss industries. Have you noticed that the primary sales tool in any weight loss or fitness programme is a before and after photograph? There is always an eye catching and impressive before-after photo. The before photo generally shows the unsmiling face (not here though! – see below) and the classic large belly. The after photo shows a bright smiley face with either an exposed torso or the person standing in a pair of their old ill fitting trousers! There are many different exercise programmes and diets but generally the key reason the programmes fail is because people give up. Thinking about this, I wonder: is the act of standing in front of the camera – embarrassed and ashamed – and getting a photo taken a key factor in cementing someone’s commitment to stick to an exercise/diet plan? In the goal-setting/ life coaching business, announcing your goals as a public statement of intent is quoted by leading experts as one of the cornerstones of reaching goals and achieving success. Is that what the before photo does? So, alongside the weigh in, should anyone looking to get healthier and lose weight/ exercise get a set of before shots to paste around their house? If we want to have the ‘after-shot physique’, perhaps the starting point on that journey is actually taking some before-shots! What lessons can clinicians take? With easy access digital photography at our fingertips, could clinicians make more routine use of before shots to show starting posture and weight and thus help patients comply to a given exercise/rehab/posture corrections programme? ‘This is how you look now, here is the goal and this is how we want you to look’ As one saying goes ‘if you can see it, you can believe it’ and another says ‘if you can believe it you can achieve it’. If you have an opinion, you can use the comment box below. 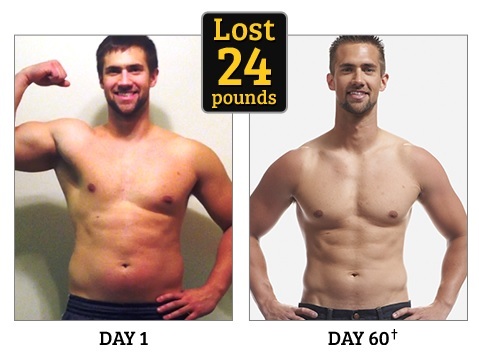 PS – In the photo I use above, the before shot actually shows the guy smiling … hmmm. I wonder, in taking the photo is that he knows what he is committing himself to do and he is smiling because he is excited by that prospect? I think that he has faith in the programme and by taking the photo he is committing himself to the end goal. Often improvements in health are subtle and are revealed by the change in someone’s face. Patients can forget what they were like when they started, so this may really help them appreciate what you have done for them. The other morning, one of my daughters was watching the TV shopping channel where ‘Shaun T’ was selling the 60 day workout programme – INSANITY. I had actually heard of Insanity because my gym instructor had lost 2 stone doing the programme and also, he had the classic “after shot” physique! So I watched some of it and it got me thinking about back pain. One of the bonuses Insanity gives is a 60 day wall chart calendar where people tick off their exercise days. Why would Insanity offer that? Sure, it’s a free bonus but they could give any kind of bonus. The reason they choose the Wall Calendar is to help customers with self-discipline and thus help customers comply with the programme. Such an approach is more likely to lead to a happy customer and therefore company is happy because they don’t have to honour the money back guarantee from people giving up! You may have read my piece about using exercise diaries to plan when patients will do their exercises. This is a way to help patients be more disciplined in planning and doing their exercises so they get the benefits (i.e. diaries help with compliance). Why not go a stage further and get some A3 clinic-branded posters printed with a 60 day exercise planner? Give one to each patient to put on their wall; they then tick off the days as they do their exercise. For 2-5p, a (branded) wall calendar is something else to hold patients accountable to themselves. It contributes to an overall professional patient approach and since you are giving it to your patient like a piece of homework, they may feel honour-bound to use it (and it just so happens to be good for them!). Put it this way, which of these adjuncts is more likely to have a positive effect on exercise compliance? You can choose to use nothing pending a clinical trial to categorically prove diaries and a wall calendar will help patients comply with their exercise programme, or you could just go for it!! !